CU Faculty & Staff: Take advantage of our simple Payroll Deduction option! 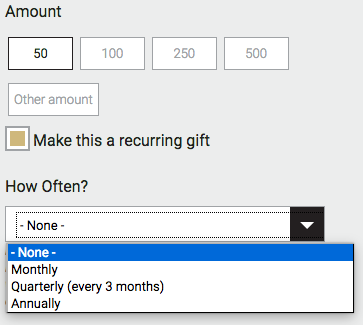 When giving online, choose the fund you'd like to give to, enter your gift amount, and then check the box next to “Make this a recurring gift.” You will then have the option to set how often you wish your gift to recur: Monthly, Quarterly or Annually. Please note that the recurring gift option applies to all gifts in your Gift Basket, and cannot be set up on a fund-by-fund basis within a single donation. To make a separate one-time gift, or one with a different recurring schedule, you will need to complete them separately. You can also set up a recurring gift over the phone by calling us at 303-541-1290. Recurring gifts continue in perpetuity until you request to cancel or change them. To cancel or change a recurring gift, please email gifts@cufund.org or call 303-541-1290. • What are Recurring Gifts?